↪ The Army Painter T..
↪ SAGA: How to paint..
↪ You Only Need One ..
↪ Speed paint a 40K ..
↪ In Rude Elf - Mini.. The Army Painter Technique G.. The ultimate guide on how to Get More Time for Gaming. 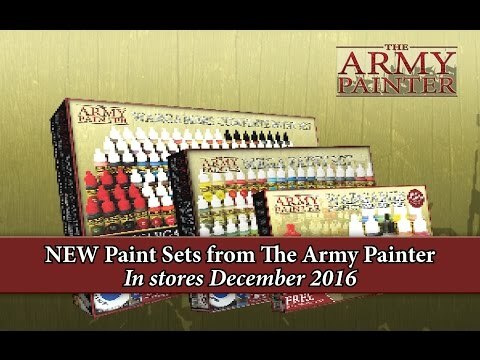 The Army Painter Technique Guide is.. Learn the what to do and what not to do of when spraying with Colour Primers in this essenti.. Learn the basics in this how to use guide for Quickshade. We run you through the Dipping and..
A nicely based army is the finishing point when making your battle force ready for the gamin.. The complete guide to the range of Warpaints colours from The Army Painter. Learn how to use..
Guide to assembling your min.. There are many tools and different types of glue around. This guide will focus on assembling.. The official painting guide for your Zombicide miniatures. Learn the basic techniques from s..